wanted to get these pictures up ASAP to at least give you guys a little teaser / inspiration. 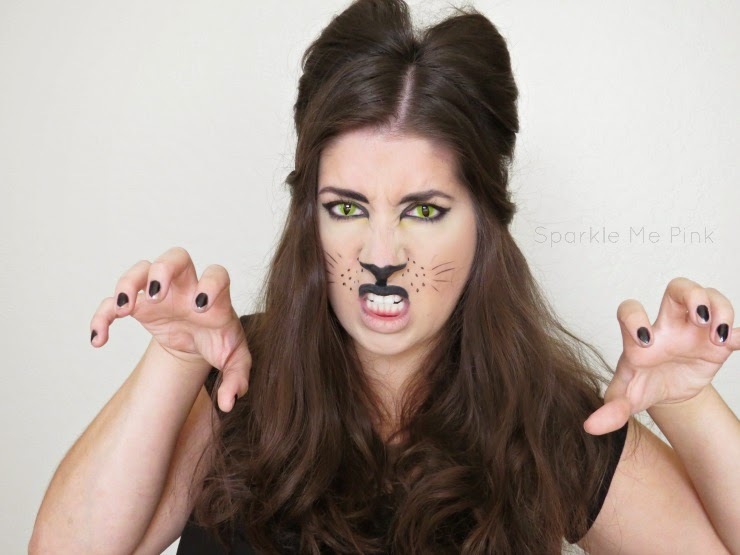 Can you believe that Halloween is less than 48 hours away !? Where does the time go ? I had so much fun doing up this look. 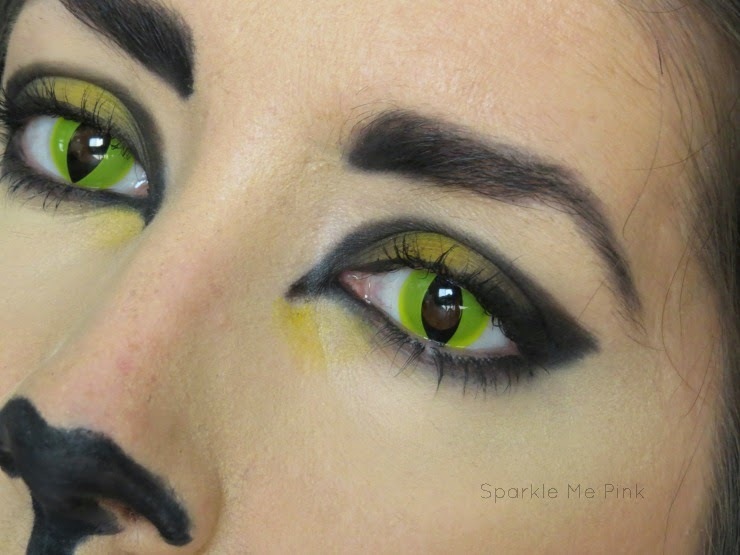 I actually wasn't planning on doing a Halloween post at all but then I remembered I had these super cool contact and knew I had to do something! 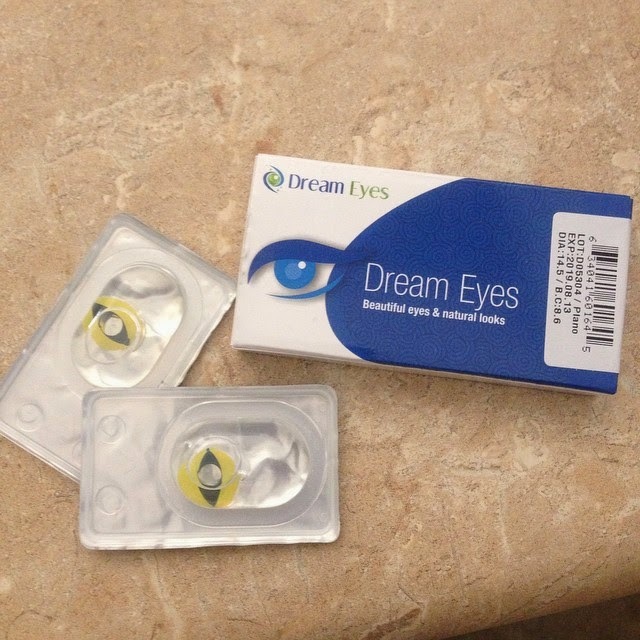 This was the first time I had popped in contacts in a few years. I was very surprise how easy these were to place. They did slide around on my eye as you can see in the video. Not a huge deal, I would just take my finger and slide the contact over so the cat lines straight up and down. Funny thing is I am actually going to be dressing up as a witch on Halloween so keep an eye out on my social media pages for some pictures of the look that day. or use the Hashtag #SparkleMePink so I can see them and maybe even share a few. 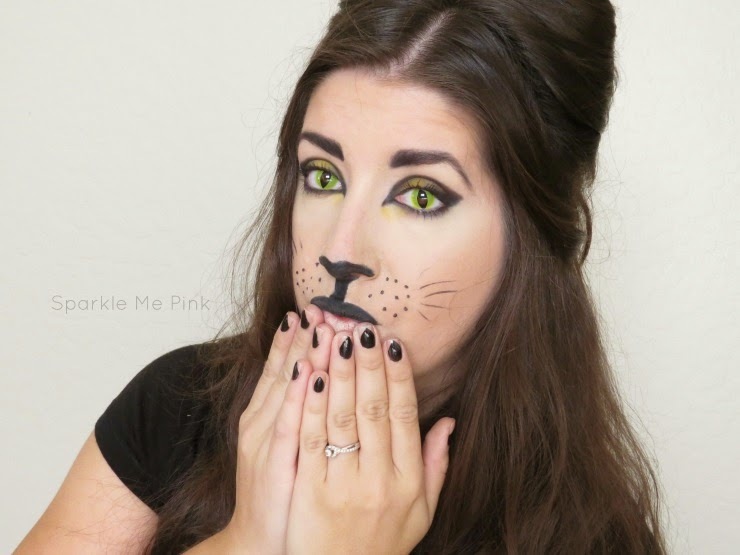 Now onto a photo bomb of this 'cat inspired' look I put together. I know this is not super original or super detailed. I really didn't have a particular idea in mind when I was doing this. Just was sort of winging it. For the eyes I used a yellow from a Revlon Colorstay quad : 583 Exotic. 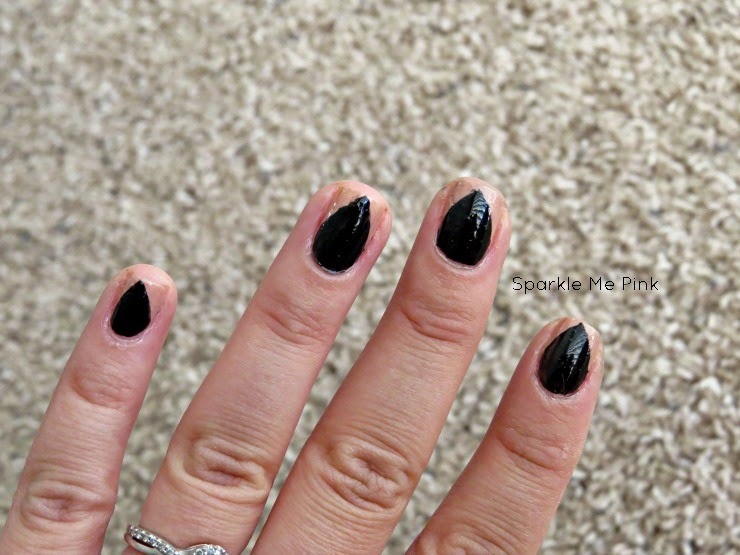 The black is from the Lorac Pro Palette. 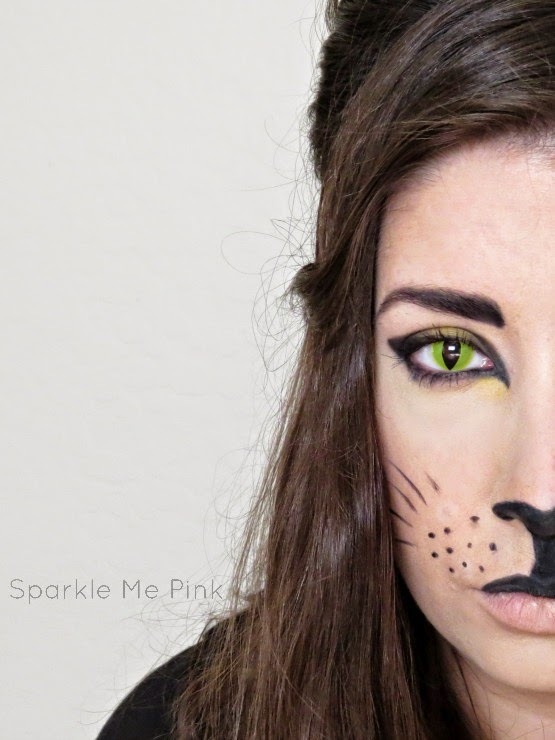 For around the nose and lip I used both a Rimmel Scandaleyes waterproof eyeliner as well as the Wet n Wild Fergie creme eyeliner pot in Little Black Dress. How cool are these ?? I had a dream I painted my nails like claws so the next morning I looked it up on Pinterest and sure as heck their was a photo of exactly what I had in mind - so cool ! And I didn't have to file my nails to point #score ! For the hair -- honestly I am not to this part of the video to edit just yet so not sure how it'll turn out on film BUT I tried to follow these two hair tutorials. ( Kayley Melissa & Bebexo ) Now my hair is long, thick and stubborn. I tried, but I think these too ladies did a much better job of showing how to execute this hair doo. 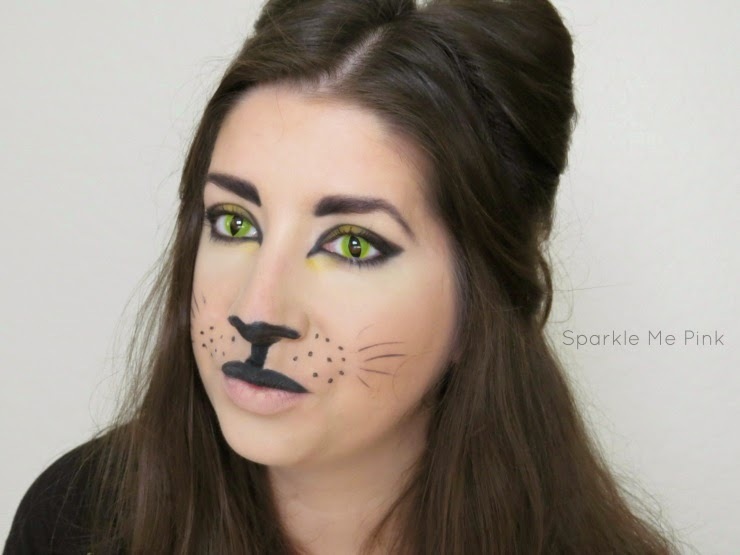 I will update this post with the tutorial once it is up and running :-) Thank you for your patience ! 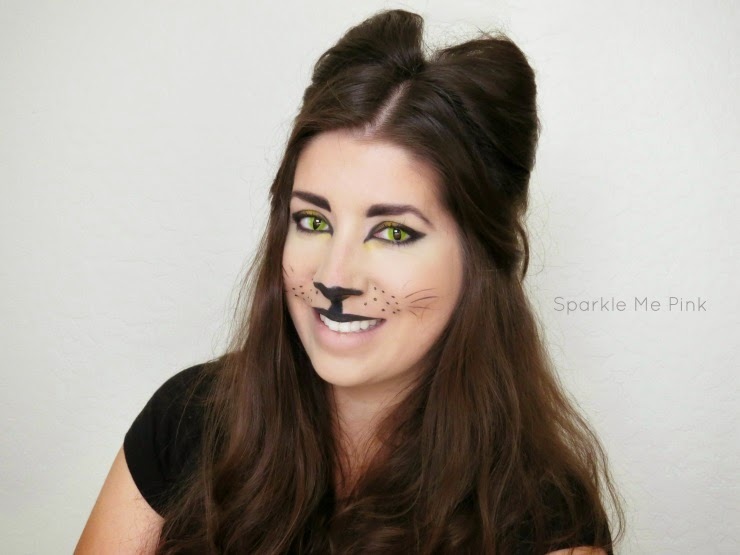 What do you think about this cat inspired Halloween makeup look ? UPDATE : Here is the video as promised.